—of a cause for which others were responsible. As an example of such a crime I would recite the circumstances connected with George Vincent Parker, making some alteration in the names of persons and of places wherever there is a possibility that pain might be inflicted by their disclosure. Nearly forty years ago there lived in one of our Midland cities a certain Mr. Parker, who did a considerable business as a commission agent. He was an excellent man of affairs, and during those progressive years which intervened between the Crimean and the American wars his fortune increased rapidly. He built himself a villa in a pleasant suburb outside the town, and being blessed with a charming and sympathetic wife there was every prospect that the evening of his days would be spent in happiness. The only trouble which he had to contend with was his inability to understand the character of his only son, or to determine what plans he should make for his future. George Vincent Parker, the young man in question, was of a type which continually recurs and which verges always upon the tragic. By some trick of atavism he had no love for the great city and its roaring life, none for the weary round of business, and no ambition to share the rewards which successful business brings. He had no sympathy with his father’s works or his father’s ways, and the life of the office was hateful to him. This aversion to work could not, however, be ascribed to viciousness or indolence. It was innate and constitutional. In other directions his mind was alert and receptive. He loved music and showed a remarkable aptitude for it. He was an excellent linguist and had some taste in painting. In a word, he was a man of artistic temperament, with all the failings of nerve and of character which that temperament implies. In London he would have met hundreds of the same type, and would have found a congenial occupation in making small incursions into literature and dabbling in criticism. Among the cotton - brokers of the Midlands his position was at that time an isolated one, and his father could only shake his head and pronounce him to be quite unfit to carry on the family business. He was gentle in his disposition, reserved with strangers, but very popular among his few friends. Once or twice it had been remarked that he was capable of considerable bursts of passion when he thought himself ill-used. This is a type of man for whom the practical workers of the world have no affection, but it is one which invariably appeals to the feminine nature. There is a certain helplessness about it and a naïve appeal for sympathy to which a woman’s heart readily responds — and it is the strongest, most vigorous woman who is the first to answer the appeal. We do not know what other consolers this quiet dilettante may have found, but the details of one such connection have come down to us. 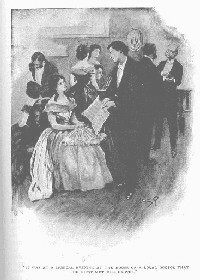 It was at a musical evening at the house of a local doctor that he first met Miss Mary Groves. The doctor was her uncle, and she had come to town to visit him, but her life was spent in attendance upon her grandfather, who was a very virile old gentleman, whose eighty years did not prevent him from fulfilling all the duties of a country gentleman, including those of the magisterial bench. After the quiet of a secluded manor-house the girl in the first flush of her youth and her beauty enjoyed the life of the town, and seems to have been particularly attracted by this refined young musician, whose appearance and manners suggested that touch of romance for which a young girl craves. He on his side was drawn to her by her country freshness and by the sympathy which she showed for him. Before she returned to the Manor-house friendship had grown into love and the pair were engaged. But the engagement was not looked upon with much favour by either of the families concerned. Old Parker had died, and his widow was left with sufficient means to live in comfort, but it became more imperative than ever that some profession should be found for the son. His invincible repugnance to business still stood in the way. On the other hand the young lady came of a good stock, and her relations, headed by the old country squire, objected to her marriage with a penniless young man of curious tastes and character. So for four years the engagement dragged along, during which the lovers corresponded continually, but seldom met. At the end of that time he was twenty-five and she was twenty-three, but the prospect of their union seemed as remote as ever. At last the prayers of her relatives overcame her constancy, and she took steps to break the tie which held them together. This she endeavoured to do by a change in the tone of her letters, and by ominous passages to prepare him for the coming blow. On August 12th, 18—, she wrote that she had met a clergyman who was the most delightful man she had ever seen in her life. “He has been staying with us,” she said, “and grandfather thought that he would just suit me, but that would not do.” This passage, in spite of the few lukewarm words of reassurance, disturbed young Vincent Parker exceedingly. 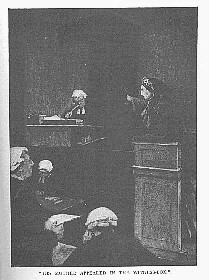 His mother testified afterwards to the extreme depression into which he was thrown, which was the less remarkable as he was a man who suffered from constitutional low spirits, and who always took the darkest view upon every subject. Another letter reached him next day which was more decided in its tone. This second letter had an overpowering effect. His state was such that his mother had to ask a family friend to sit up with him all night. He paced up and down in an extreme state of nervous excitement, bursting constantly into tears. When he lay down his hands and feet twitched convulsively. Morphia was administered, but without effect. He refused all food. He had the utmost difficulty in answering the letter, and when he did so next day it was with the help of the friend who had stayed with him all night. His answer was reasonable and also affectionate. As Professor Owen would reconstruct an entire animal out of a single bone, so from this one little letter the man stands flagrantly revealed. The scraps of French, the self-conscious allusion to his own savoir faire, the florid assurances which mean nothing, they are all so many strokes in a subtle self-portrait. About two miles upon the other side of the Manor-house, and four miles from the Bull’s Head Inn, there is a thriving grammar school, the head master of which was a friend of the Groves family and had some slight acquaintance with Vincent Parker. The young man thought, therefore, that this would be the best place for him to apply for information, and he arrived at the school about half-past one. The head master was no doubt considerably astonished at the appearance of this dishevelled and brandy-smelling visitor, but he answered his questions with discretion and courtesy. “I understood that there was an engagement, and that it had been broken off,” said the master. “I will find it out sooner or later,” said Parker, and then asked who the clergyman was who had been staying at the Manor-house. The master acknowledged that there had been one, but refused to give the name. Parker then asked whether Miss Groves was at the Manor-house and if any coercion was being used to her. The other answered that she was at the Manor-house and that no coercion was being used. 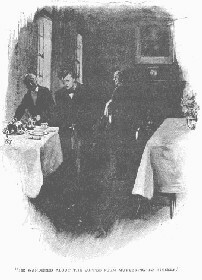 The master then remarked that it was time for school, but that he should be free again at half-past four if Parker had anything more to say to him, and Parker left, promising to return. It is not known how he spent the next two hours, but he may have found some country inn in which he obtained some luncheon. At half-past four he was back at the school, and asked the master for advice as to how to act. The master suggested that his best course was to write a note to Miss Groves and to make an appointment with her for next morning. “If you were to call at the house, perhaps Miss Groves would see you,” said this sympathetic and most injudicious master. “I will do so and get it off my mind,” said Vincent Parker. It was about five o’clock when he left the school, his manner at that time being perfectly calm and collected. It was forty minutes later when the discarded lover arrived at the house of his sweetheart. He knocked at the door and asked for Miss. Groves. She had probably seen him as he came down the drive, for she met him at the drawing-room door as he came in, and she invited him to come with her into the garden. Her heart was in her mouth, no doubt, lest her grandfather should see him and a scene ensue. It was safer to have him in the garden than in the house. They walked out, therefore, and half an hour later they were seen chatting quietly upon one of the benches. A little afterwards the maid went out and told Miss Groves that tea was ready. She came in alone, and it is suggestive of the views taken by the grandfather that there seems to have been no question about Parker coming in also to tea. She came out again into the garden and sat for a long time with the young man, after which they seem to have set off together for a stroll down the country lanes. What passed during that walk, what recriminations upon his part, what retorts upon hers, will never now be known. They were only once seen in the course of it. At about half-past eight o’clock a labourer, coming up a long lane which led from the high road to the Manor-house, saw a man and a woman walking together. As he passed them he recognised in the dusk that the lady was Miss Groves, the granddaughter of the squire. When he looked back he saw that they had stopped and were standing face to face conversing. A very short time after this Reuben Conway, a workman, was passing down this lane when he heard a low sound of moaning. He stood listening, and in the silence of the country evening he became aware that this ominous sound was drawing nearer to him. A wall flanked one side of the lane, and as he stared about him his eye caught something moving slowly down the black shadow at the side. For a moment it must have seemed to him to be some wounded animal, but as he approached it he saw to his astonishment that it was a woman who was slowly stumbling along, guiding and supporting herself by her hand against the wall. With a cry of horror he found himself looking into the face of Miss Groves, glimmering white through the darkness. 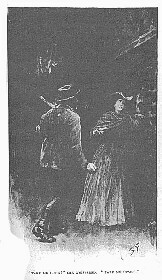 The horrified labourer put his arms round her, and carried her for about twenty yards towards home. “Can you see anyone down the lane?” she asked, when he stopped for breath. He looked, and through the dark tunnel of trees he saw a black figure moving slowly behind them. The labourer waited, still propping up the girl’s head, until young Parker overtook them. “Who has been murdering Miss Groves?” asked Reuben Conway. “I have stabbed her,” said Parker, with the utmost coolness. “Well, then, you had best help me to carry her home,” said the labourer. So down the dark lane moved that singular procession: the rustic and the lover, with the body of the dying girl between them. When they got as far as the lodge-gate Parker suggested that Reuben Conway should run and get something which might stanch the bleeding. He went, leaving these tragic lovers together for the last time. When he returned he found Parker holding something to her throat. “Is she living?” he asked. “Oh, take me home!” wailed the poor girl. A little farther upon their dolorous journey they met two farmers, who helped them. “Who has done this?“ asked one of them. These replies never seem to have brought insult or invective upon his head, for everyone appears to have been silenced by the overwhelming tragedy of the situation. “I am dying!” gasped poor Mary, and they were the last words which she ever said. Inside the hall-gates they met the poor old squire running wildly up on some vague rumour of a disaster. The bearers stopped as they saw the white hair gleaming through the darkness. “What is amiss?” he cried. “Who did it?” shrieked the old man. “Who are you ?“ he cried. The calm concentration of his manner seems to have silenced all reproaches. The body was carried into the kitchen and laid upon the table. 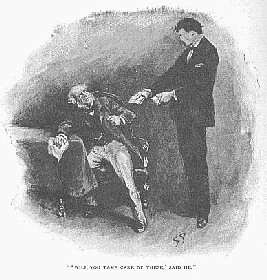 In the meantime Parker had followed the bewildered and heart-broken old man into the drawing-room, and holding out a handful of things, including his watch and some money, he asked him if he would take care of them. The squire angrily refused. He then took two bundles of her letters out of his pocket—all that was left of their miserable love story. The grandfather took the letters and they were duly burned. “What have you done with the knife?” asked the policeman. Parker produced it from his pocket, a very ordinary one with a clasp blade. It is remarkable that two other penknives were afterwards found upon him. They took him into the kitchen and he looked at his victim. “I am far happier now that I have done it than before, and I hope that she is,” said he. This is the record of the murder of Mary Groves by Vincent Parker, a crime characterized by all that inconsequence and grim artlessness which distinguish fact from fiction. In fiction we make people say and do what we should conceive them to be likely to say or do, but in fact they say and do what no one would ever conceive to be likely. That those letters should be a prelude to a murder, or that after a murder the criminal should endeavour to stanch the wounds of his victim, or hold such a conversation as that described with the old squire, is what no human invention would hazard. One finds it very difficult on reading all the letters and weighing the facts to suppose that Vincent Parker came out that day with the preformed intention of killing his former sweetheart. But whether the dreadful idea was always there, or whether it came in some mad flash of passion provoked by their conversation, is what we shall never know. It is certain that she could not have seen anything dangerous in him up to the very instant of the crime, or she would certainly have appealed to the labourer who passed them in the lane. The case, which excited the utmost interest through the length and breadth of England, was tried before Baron Martin at the next assizes. There was no need to prove the guilt of the prisoner, since he openly gloried in it, but the whole question turned upon his sanity, and led to some curious complications which have caused the whole law upon the point to be reformed. His relations were called to show that madness was rampant in the family, and that out of ten cousins five were insane. His mother appeared in the witness-box contending with dreadful vehemence that her son was mad, and that her own marriage had been objected to on the ground of the madness latent in her blood. All the witnesses agreed that the prisoner was not an ill-tempered man, but sensitive, gentle, and accomplished, with a tendency to melancholy. The prison chaplain affirmed that he had held conversations with Parker, and that his moral perception seemed to be so entirely wanting that he hardly knew right from wrong. Two specialists in lunacy examined him, and said that they were of opinion that he was of unsound mind. The opinion was based upon the fact that the prisoner declared that he could not see that he had done any wrong. The doctor attempted to argue with him. “Suppose anyone took a picture from you, what steps would you take to recover it?” he asked. The doctor pointed out that the law was there to be appealed to, but Parker answered that he had been born into the world without being consulted, and therefore he recognised the right of no man to judge him. The doctor’s conclusion was that his moral sense was more vitiated than any case that he had seen. That this constitutes madness would, however, be a dangerous doctrine to urge, since it means that if a man were only wicked enough he would be screened from the punishment of his wickedness. Baron Martin summed up in a common-sense manner. He declared that the world was full of eccentric people, and that to grant them all the immunity of madness would be a public danger. To be mad within the meaning of the law a criminal should be in such a state as not to know that he has committed crime or incurred punishment. Now, it was clear that Parker did know this, since he had talked of being hanged. The Baron accordingly accepted the jury’s finding of “Guilty,” and sentenced the prisoner to death. There the matter might very well have ended were it not for Baron Martin’s conscientious scruples. His own ruling had been admirable, but the testimony of the mad doctors weighed heavily upon him, and his conscience was uneasy at the mere possibility that a man who was really not answerable for his actions should lose his life through his decision. It is probable that the thought kept him awake that night, for next morning he wrote to the Secretary of State, and told him that he shrank from the decision of such a case. The Secretary of State, having carefully read the evidence and the judge’s remarks, was about to confirm the decision of the latter, when, upon the very eve of the execution, there came a report from the gaol visitors—perfectly untrained observers — that Parker was showing undoubted signs of madness. This being so the Secretary of State had no choice but to postpone the execution, and to appoint a commission of four eminent alienists to report upon the condition of the prisoner. These four reported unanimously that he was perfectly sane. It is an unwritten law, however, that a prisoner once reprieved is never executed, so Vincent Parker’s sentence was commuted to penal servitude for life — a decision which satisfied, upon the whole, the conscience of the public.